Face it: most DJs these days rely on a laptop, MP3s, and some sort of mixing software. Whether you’re using a MacBook, Windows laptop or even Linux; there’s plenty of software out there to get the job done. Every level of skill and budget is catered for if you want to start DJing with your Mac or PC — and we’ve got the software to prove it. If all you want is a little more control than iTunes or VLC provides and you don’t want to spend any money you might want to try one of these. 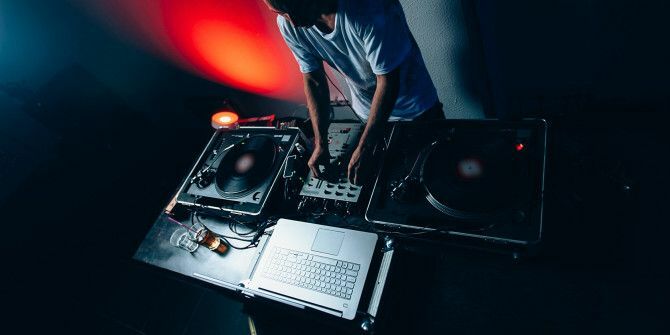 Don’t write off Mixxx just because it’s free — this is one of the most feature-rich DJ packages out there, and it’s thanks in part to a dedicated community and open source software model. Mixxx includes two decks, each of which support scratching, looping, hotcues, and time stretching. Pitch bending, beat detection, an equalizer, and crossfader curve control give you the tools you need for silky smooth transitions. There are also four sampler decks for firing off vocal samples and sound effects, a music library that integrates with iTunes, and some intuitive sorting options — like “crates” for sets. There’s surprisingly good support for external hardware, which is something you’d normally expect from the more expensive DJ packages on this list. What’s more, Serato-style vinyl timecode control is included too, allowing you to manipulate Mixxx using your turntables. Mixxx isn’t a premium product, and that means you might find that it’s not as dependable as some of the paid packages on this list. There’s a Wiki full of tutorials and troubleshooting tips, and a community support forum that’s (mostly) full of users reporting issues with their particular hardware. Bottom line: An amazing free package and the only option here for Linux users, but you might want to thoroughly test it before adopting it for live shows. Mixvibes is the company behind the Cross DJ, a suite of applications that target just about every market of wannabe DJ, starting here with the beginner. Despite being an ultimately paid product, this free version of Cross DJ doesn’t have any limitations in terms of features or commercials — but there’s no MIDI support for external hardware. The app comes with two decks (with support for video mixing) that each support hotcues and loops, beat detection, a three-band equalizer and three audio effects. Unfortunately, being a limited free option, Cross DJ Free foregoes many of the bells and whistles most DJs expect to see: samplers, quantizing, key detection among others are all missing in this version. A lack of support for DJ hardware means you’ll be stuck using the Cross DJ iOS Remote ($4.99) or your keyboard and pointing device until you decide to upgrade to the next version of Cross DJ ($49). It’s a nice way to learn to DJ, but it’s definitely a package you’ll outgrow (possibly sooner than you think, when you realize just how useful dedicated hardware controls are). Bottom line: A nice way to learn the basics with plenty of polish and user-friendly features, but ultimately limited in scope thanks to a software limitations and a lack of hardware support. Virtual DJ is one of the most recognizable DJ packages Mix & Fade Your Music Tracks With Virtual DJ Free Mix & Fade Your Music Tracks With Virtual DJ Free Read More on this list, partly because it’s been around for ages (the first version was released in July 2003, though it was known as AtomixMP3 before that) and partly because it’s always had an attractive free option. Unfortunately, a disclaimer on the Virtual DJ site reads “we might display some advertisement from time to time” for free users. What you get in exchange is complete access to the Virtual DJ 8 system minus support for DJ controllers. Just like Cross DJ Free (above), you’re limited to using your mouse and keyboard, which is a method of mixing you’ll grow tired of quickly. The system provides support for up to 99 decks, which you’ll never need, with 4 and 6 deck skins included for those who need them. The feature-list is rich: powerful organization features, an iTunes-match like streaming service (requires subscription), support for video mixing and a large number of deployable effects including a flanger, echo, and beat slicer. There’s even a built in sampler which you can record to on the fly and use as a sequencer. The problem with Virtual DJ is the pricing model. You’ll either need to limp on with the free version, upgrade to an “Advanced Home” license that’ll cost you between $49 and $199 depending on your hardware, or go big and buy a “Pro Infinity” license for $299. Bottom line: Powerful software with a rich history, support for video mixing, and a plethora of features — but it’ll cost you when it comes to upgrading. Fancy something a little more powerful without spending the big bucks? These mid-range options are user-friendly and relatively cheap, which means you can spend the rest of your money on music. Algoriddim’s djay suite started life on the iPad as an incredibly intuitive touch-screen DJ app and has now grown into a whole family of software, perfect for any budget. While the iOS variants are all about having fun (particularly the iPhone version), this more expensive Mac outing is all about creating a professional sound. djay on iOS has enjoyed Spotify integration for a while now, and the Mac version is no different. You’ll need a Spotify Premium account in order to take advantage Spotify Music Streaming: The Unofficial Guide Spotify Music Streaming: The Unofficial Guide Spotify is the biggest music streaming service around. If you're not sure how to use it, this guide will walk you through the service, as well as offer some crucial top tips. Read More , and you’ll get instant access to over 20 million songs when you link your account. That’s in addition to full integration with your iTunes library, of course. In terms of features djay is a powerful tool that tries to tick many boxes. In addition to four scratchable decks, colored waveforms, a sampler, and drum pads, the app includes effects, loop and cue points, beat and key matching, and excellent support for MIDI controllers and USB audio interfaces. There’s even full support for mixing video, just like that found in algoriddim’s ($9.99) iPad app. What’s more this is software built for OS X, and OS X only. It uses a graphics engine that pushes out 60 frames per second, it’s optimized for Retina MacBooks and 5K iMacs, and it will even sync your cue points and metadata with iOS versions over iCloud. Bottom line: An instant DJ solution and record collection when paired with Spotify, easy to learn, simple to use, but lacking the depth found elsewhere. Bringing with it everything found in the free version, Cross DJ’s mid-tier offering ups the ante with four decks, 14 full effects, two samplers, and all the MIDI control you could want. Cross DJ is compatible with more than 80 DJ controllers, with a MIDI mapping editor though timecode control for CD, and vinyl is missing. Display your music as a waveform and skip backwards and forwards between beats for easy cueing — you can even detect and lock musical key, for truly seamless transitions. Customizable routing options allow you to take full advantage of external audio interfaces, and like all versions the app supports the mixing of video. If you need MIDI control and aren’t too bothered about video mixing or timecode control, Cross DJ is a fully featured package for a relatively low price. Bottom line: Nearly everything you could want for less than €50, with limitations on video output and timecode control. Compare versions and consider the full version of Cross ($129), if you like the package, but need more. Deckadance is a digital DJ app from Image Line, the company responsible for FL Studio (previously known as FruityLoops). Now on its second major release, Deckadance provides a capable two or four deck solution, with a total of 10 audio effects (three of which can be chained together). There’s a powerful in-built sampler that supports beat matching, a feature known as “Smartknobs”, which links any number of effect and mixer interface elements under one control and “GrossBeat” — a feature that provides programmable glitching, stuttering and scratching. This sits on top of an entirely customizable user interface that aims to only show you the features you will actually use, allowing you to configure decks, so-called “smart panels” and other controllable elements as you see fit. The app has full support for external MIDI devices and DJ controllers, iTunes library integration, and even added support for VSTi (host and client) virtual instruments. Bottom line: There’s a lot to sink your teeth into here, with an emphasis on customization and technical control, providing more depth than djay or Cross DJ at the cost of user-friendliness. If you’re really aiming for truly memorable performances and want the best money can buy, you can’t go wrong with a professional DJ package. When you buy a product like Traktor Pro, you’re not only buying access to the software’s functionality, but the name on which the brand was built. Traktor has become somewhat of a standard among DJs, trusted by some of the biggest names and busiest venues. Of course, Traktor Pro is drowning in premium features as well. Traktor has four decks including remix decks, which can each hold up to 64 samples and be saved as a set in your playlist. You can then quickly recall your remix deck whenever you need it, or simply download a selection of free remix sets from Traktor. You can see this powerful feature in action in the video below. A powerful library that integrates with iTunes makes it easy to find what you’re looking for, excellent sync controls track tempos, beatgrids, and musical key, so that mixes can be automatically beatmatched perfectly. Over thirty separate effects can be grouped and customized, and complex looping and cueing tools allow you to skip around your tracks in perfect time. Traktor is such a big name that the company makes its own DJ hardware, designed solely for use with Traktor Pro. Of course there’s also industry-leading compatibility with almost any MIDI controller — if in doubt, look for the “Traktor ready” logo before you buy. Bottom line: An incredibly full-featured audio package built by a highly respected name, but be prepared to spend real money on hardware controllers. Serato is another big-name player in the digital DJ sphere, building its name on impressive digital vinyl system (DVS) support. This method of emulation uses a time-coded vinyl record and analogue to digital audio signal converter in order to manipulate digital music files with the tactile feel of vinyl 4 Reasons Why Vinyl Is Better Than Digital 4 Reasons Why Vinyl Is Better Than Digital Greetings, peasants! What, still listening to MP3s? Look, as someone who knows more about music than you, I think it's my duty to tell you there's a better way. It's called vinyl. Read More . Surprisingly, DVS support is an optional add-on for Serato these days, since the developers adopted a more modular approach. The basic setup includes four decks complete with full colour waveforms that visually represent bass, mid and treble audio frequencies. Quick sync controls are available to DJs who want it, allowing you to beat-match in an instant (but you can also turn this off for a “pure” DJ experience). Hotcues and loops are present and “Slip Mode” allows you to scratch seamlessly in time with the music. Serato really lets you get hands on with your set and various elements. You can name your eight available cues and loops and quantize them so they launch perfectly with the beat. A feature called “Beat Jump” lets you jump a determined beat size back and forth through your track, for repeating elements or skipping large sections. Serato comes with support for a range of DJ controllers that are built with DVS in mind, but also other non-DVS controllers and even MIDI-compliant controllers like the Maschine. There’s also an iOS companion app called Serato Remote ($19.99) which provides touch-screen access to all features. The package is rounded off nicely with a comprehensive library that fully integrates with iTunes, but also allows you to create “smart crates” — tracks groups by keyword, genre, tempo, or other rules. If you need it you can take Serato to the next level with video support for an additional $149 (cheaper when purchased as a bundle). Bottom line: If you want a DVS setup, this is the way to go. Be aware the costs will rack up as you will need to buy Serato DJ, relevant expansion packs, and DVS equipment — maybe even a set of decks. Another big name, but arguably not as well-known as Traktor or Serato; PCDJ DEX 3 is a fully featured DJ solution with support for four decks, video mixing, and a karaoke mode. Just like Serato, there is support for time-coded vinyl and CD control (though don’t expect the same level of support as the former). The app includes automatic grid-based tempo detection and beat-matching, pitch scaling, and key lock. Intelligent looping and beat-skip features provide you with space to breathe while cueing up your next track or loading a one-shot into the included sampler. PCDJ even supports VSTi virtual instruments 12 Free VST Plugins Every Musician Must Have 12 Free VST Plugins Every Musician Must Have Virtual Studio Technology makes music production easier than ever, and these free VST plugins are the best of the best. Read More like synthesizers, drum machines, and effect modules. Perceptual gain normalizes your tracks, so they play at the right volume. Video mixing support is also fairly complete with pitching, reverse playback, and the ability to scratch videos. A selection of effects and transitions are designed specifically for VJs. PCDJ takes great pride in its appearance, with a fully customisable skin system and skin designer. All of this sits on top of a responsive “no latency” playback engine with support for more than 65 DJ controllers. Bottom line: All the video and audio mixing you could want, with a highly customizable interface that might not suit everyone. Ableton Live isn’t strictly DJ software, but a sequencer and digital audio workstation for creating and performing electronic music live. It doesn’t come with the traditional two or four deck setup, and it doesn’t look or behave anything like the other DJ software found on this page. For this reason, it won’t suit every DJ or performer. The software comes with excellent support for external MIDI devices and interfaces, gigabytes of included sounds, effects and instruments — depending on whether you opt for the Intro, Standard or Suite package. It’s worth noting that the $749 Suite edition comes with an expanded “Max for Live” pack which massively expands the software’s potential as a live performance tool. The software is equipped with three samplers, 4000 audio and MIDI patterns, nearly 400 drum kits, and support for third-party software controllers on iOS and Android. It’s a box of tricks and it’ll require a clear vision of what you want to achieve in order to make the most of it — but it will do more than any of the other suites on this list. Bottom line: A feature-packed music creation and performance tool for those of you unsatisfied with traditional DJ packages, who want to create something extra special. Are you a DJ? What DJ software do you prefer? Explore more about: DJ Software, Record Audio. I would suggest VirtualDJ anytime. It is really easy to use for starters but at the same time there is so much power under the hood and it can be as much powerfull and advanced as the user want it to be (with vdj script langiage). It supports more dj controllers than any other dj software as far i know. 2019 and virtual dj still tops them all. to me the best software definitely is djay Pro with the Spotify integration. I prefer Virtual DJ Pro Infinity...It has all the tools and then some. I use it with my 900 Nexus and it works beautifully. I am looking at learning to DJ but primarily want to focus on remixes and mashups of multiple songs, what software would you recommend keeping in mind that I have no experience? I was looking at the Traktor Pro 2 and I would be operating with a MacBook Pro 13" non - retina, what do you think? Ableton really is more of a live/production tool, but can be made supremely flexible with the right controller. The Akai range of Ableton controllers are more suited to live sets whereas Ableton's own controller (made for them by Akai, funnily enough) is more suited to the studio. You really need to include prices of controllers to give readers a better idea of what their initial expense will be like. Yeah Ableton is definitely the wildcard, and I think I made that clear in the article. It's nothing like traditional DJ software and is more suited to those looking for something to set their live shows apart and provide an opportunity to improvise a little more. There's no particularly high cost involved in getting started with Ableton outside of the initial expenditure. You can use it with a $50 MIDI controller or $5 iPad app and it would function just fine, allowing you to map various functions as you see fit. I see your point about controllers being expensive, but as the video above shows even Four Tet's setup is deceptively simple.